I bought my first dog from Charlie 6 years ago now I am going on my 4th dog. Each time I call Charlie and tell him what I am wanting and he always figures out the best dog for me. I have tried others but nothing compares to Charlie's dogs. These dogs just try so hard and you can tell all they want to do is please you. My hangin' tree cowdogs have made having cattle fun because they are always so excited to go to work for me. I now handle all of my cattle by myself with the help of my hangin' tree dogs. Charlie Trayer is really a natural when it comes to working with these wonderful hangin' tree cowdogs. 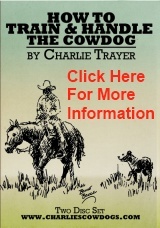 Seeing an advertisement for Trayer’s Cowdogs in “Western Horseman” prompted me to call Charlie Trayer. Over the course of many years, I have traded several Hangin' Tree Cowdogs with him and in every business transaction that I have had with him, he has been completely honest and upfront about the dog’s traits. When it comes to breeding and training Hangin' Tree Cowdogs, Charlie Trayer is at the top of the list. I got my first hangin' tree cowdog from Charlie in 1998. And since that time there has been nothing but hangin' tree cowdogs on the Jacot ranch. He knows what it’s like to put long days in the saddle gathering range cattle. He knows what kind of dog it takes to be there at the end of a long day. Charlie knows what kind of dog a cowboy needs. I highly recommend Charlie Trayer. I bought my first pup in ’02....... I now own a dozen and wouldn’t leave home without them. With my Hangin' Tree cowdogs I have been able to handle cattle that were big problems before, with less help than before, and a lot of times by myself. Charlie Trayer’s methods and his Hangin' Tree Cowdogs can get the job done.